Umbra Skinny is the slim, stylish trash can that makes a statement. A wildly popular follow up to the award-winning, best-selling Garbino garbage can, Skinny offers all the most loved features of Garbino but with a narrow, streamlined footprint that makes it ideal for small spaces. Available in a wide array of stylish colors and unique finishes to match any décor, Skinny features a sleek, modern profile that looks just as impressive in your bathroom or bedroom at home as it does by your desk at the office. 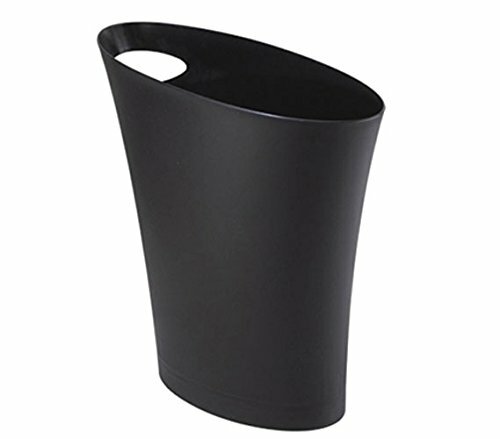 Made from polypropylene, an ultra-durable and easy-to-maintain plastic, Skinny trash can is easy to wipe clean and designed to stand up to everyday use. The built-in handle makes it easy to pick up and empty while the narrow footprint allows it to easily fit into tight spaces where an ordinary waste basket could never go. Take an everyday essential from mundane to magnificent with the Skinny Trash Can from Umbra… order yours today! Designed by Karim Rashid and David Quan for Umbra ¬¬— original, modern, casual, functional, and affordable design for the home.